HomeCinemaMasala5 reasons why Wazir has made us excited! 5 reasons why Wazir has made us excited! The second teaser of Wazir that was launched recently created a stirr amongst its audiences. 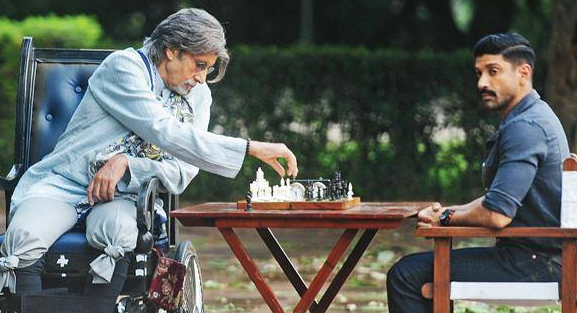 Here are 10 reasons why Wazir excites audiences. 1. Vidhu Vinodh Chopra + Rajkumar Hirani + Bejoy Nambiar : Wazir involves the best of the industry has to offer with a producer like Vidhu Vinodh Chopra and Rajkumar Hirani. The film is directed by the very talented young director Bejoy. Bejoy is said to have shot the film paying special attention to intricate details ensuring perfection. 2. Farhan Akhtar : Farhan sheds his chilled out lover boy avatar for Wazir and plays a serious ATS officer. This is the first time Farhan is playing an action role. He has worked hard to play the role where he is shown flaunting his muscular body. 3. Panditji’s chair : Amitabh Bachchan plays the character of ‘Panditji’ the movie. He is handicapped in the movie and his character demands to move in a wheel chair. The chair in question had been finalized by testing 43 chairs previously. Vidhu Vinod Chopra took months to select the chair that perfectly fit Amitabh’s characters. After selection, the chair was kept at Amitabh’s house for 3 months and Amitabh would sit on it everyday to build his character. 4. The Script : The script of the film is well thought. Abhijat Joshi has paid a lot of attention to intricate details building links forming a solid script.It took 5 years for the makers to complete the film. The writer of the film confesses to face mind blocks on penning down the complexities of each character. 5. Ensemble Star-cast – the Film features Amitabh Bachchan and Farhan Akhtar playing leads in addition Aditi Rao Hydari, Neil Nitin Mukesh and John Abraham play pivotal roles. · Aditi Rao Hydari : Aditi Rao Hydari is seen playing a crucial role in the film. She plays the character of a muslim girl. She looks stunning in the films rushes portraying to be a modest muslim girl. · Neil Nitin Mukesh : Neil Nitin Mukesh plays a dark character in the film. He is heard voicing out a darker version of the cheerful song ” lakde ki kaati” in the films 2nd teaser. · John Abraham : After tying the knot, John Abraham will be seen on celluloid for the first time. John’s fans eagerly await to catch a glimpse of the actor as an ATS officer. Feeling taken for granted in love?